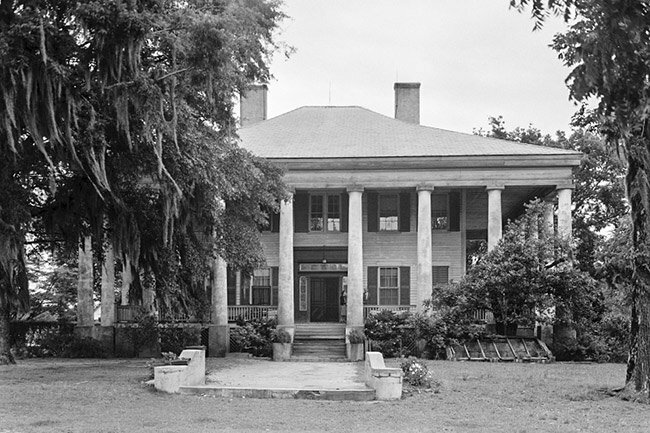 The Rankin-Harwell House – also known as The Columns – is located in Mars Bluff, a small, unincorporated community in Florence County. 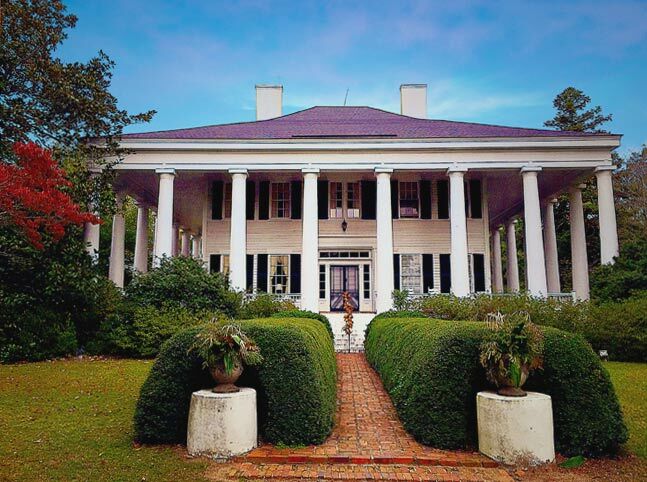 Built in 1857, the home was designed in the popular Greek Revival style and is considered to be one of the finest examples of Greek Revival antebellum architecture in South Carolina. The original owner, William Rogers Johnson, was a successful physician, planter, and legislator who later served in the South Carolina House of Representatives and the South Carolina Senate. Typical of other plantations in the region, the primary crops grown were cotton and tobacco. Because the house was constructed in 1857, the time that slave labor was used on the property was not as long as many antebellum properties, lasting roughly ten years. While the abolishment of slavery during the Civil War may have ended the legality of enslaved labor, many families remained on properties for decades, still working the properties they knew. Dr. Johnson lived here until his death in 1893 where he was buried at the nearby Hopewell Presbyterian Church. The house was acquired by Walter Rankin of Fayetteville, NC in 1902. Rankin did not get to enjoy the home for long before his death two years later but his wife, Jennie Robertson Rankin, continued to live in the home until her death in 1959. When the home was purchased, Mrs. Rankin named it “The Columns” for its massive 22 Doric columns that encircle the home’s porch. Locals dubbed the house “Carolina Hall” for its role in the 1934 film known as Carolina which starred Lionel Barrymore, Janet Gaynor and the new child actress, Shirley Temple. 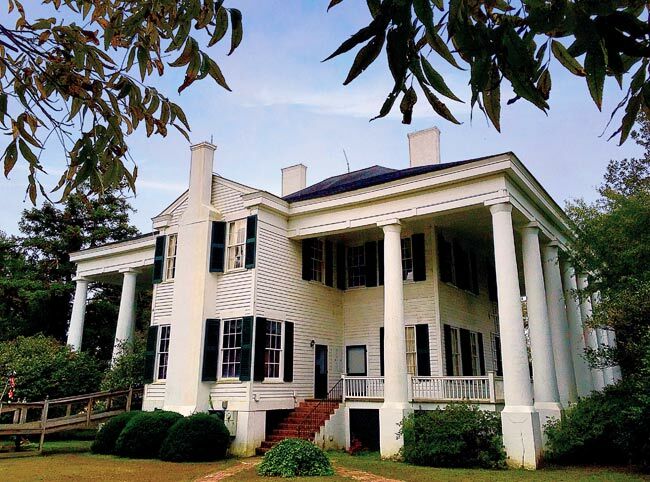 The Columns was purchased by Rankin descendant, James Harwell, in 1974 who continued to use the property as a farm raising corn, cotton tobacco and cattle. The house is still owned by descendants today and is the site of a popular annual Civil War reenactment. A scenic avenue of pecan trees and lush property make the home a popular destination for weddings and other special events. 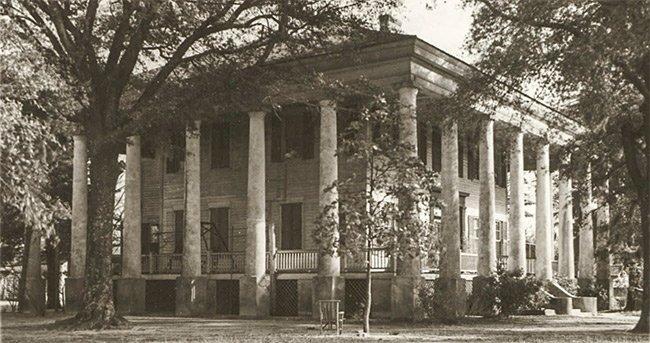 Built in 1857, the Rankin-Harwell House is an outstanding example of the Greek Revival, which was fairly prevalent in the antebellum South. The house has 22 giant order Doric columns, strict symmetry, and a painted white façade. The twenty-two freestanding Doric columns are brick covered with stucco and surround the house on three sides. The two-story frame structure rests on a raised basement. The façade has five bays. Two 6/6 double sash windows flank the entrance, which is a double doorway with transom and sidelights. Low-pitched hipped roof covers the house and portico. Two interior brick chimneys are painted white. This house is magnificent. I believe my Gradfather, William “Bill” Watts was a plantation slave overseer here and there was a relationship with Melvin Horace Purvis whose has history with the Column residence. Please advise if there are any records available on ancestry. Thank you. We would be honored to add some of their story here. Do you have further information by chance? My great great grandmother, Priscilla (Prissy) Johnson Grant and other family members were enslaved here. I hope their story will be added to the historical narrative that is shared about this home. Hi, Ashleigh! Check the Facebook site listed above the map. Hopefully, that will lead you to someone connected with the home and who can answer your questions. It is beautiful, indeed! Best of luck! Need wedding info and prices, please. Your home is beautiful. I am looking for a wedding venue in Oct of 2015. My descendants include the Harvell/Harwell family of Virginia, North Carolina, and South Carolina. I have a photograph of my grandmother, Sarah “Sallie” Elizabeth Harvell, born 1883, and I believe she is standing beside the columns in this house. Do you have any ancestral knowledge of Sarah/Sallie? I hope that my family can visit the Rankin-Harwell House this Spring, it is so beautiful! Do they have tours of the house? I would love to see the house and grounds.